'The Stahlmeister' tries out the latest 991 Carrera GT3 Cup race car. It wasn’t true to say that the virginal, white 911 GT3 Cup had never spun a wheel before. All Porsche Motorsport products are expertly shaken down at Porsche’s Weissach development track. But it’s unlikely that this car had ever spun before. Until I drove it. 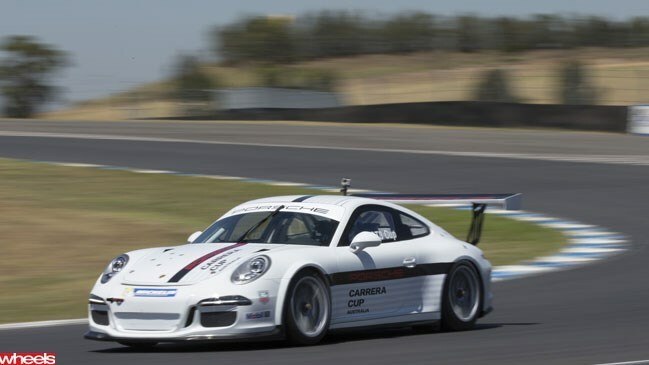 In Australia, around 25 Pro teams and ‘Elite’ gentleman racers have each shelled out €171,600 ex-factory – call it $300,000 landed, including spare parts and taxes – to make a record-sized field of 991-series cars for this year’s Carrera Cup Australia. Porsche staged a four-day handover ceremony at Sydney Motorsport Park to familiarise teams – andWheels – with the 338kW racer’s driving characteristics, and technical advances like the composite aluminium body construction, which has halved the cost of damage repairs. No thought of that as the Stahlmeister lumbered into the carbon-shelled Recaro race seat. Wrapped and strapped by the seat, harness and cage, one sits so low as to be peering over the dash. The 3.8-litre engine is loud, gnashing, mechanical. Racers rave about how easy is this car to drive: the rest of us are confronted with the sharp clutch pedal take-up and the minimal flywheel effect. I chortled around for three familiarisation laps. Fears of a GT2-like, end-swapping monster were slowly dispelled by the very top-endy power. The steering was firm and deliberate, the chassis stiff and kart-like. Too bad I never raced a kart. Out again for my proper, five-lap stint. I started trailing the brakes deeper into corners, feeling the chassis pivot mid-turn, leaning harder on the gas, working the rear. It’s squat, stable, and the paddle-shift adds to the video-game vibe. My fifth and final flying lap was a 1:39, still complete rubbish; most gentleman racers got around here in 35s in the superseded 997. But on that fifth lap, lofting over Corporate Hill, this white temptress pricked the dopamine centre in my brain. My muscles relaxed and I melted into it. So I’d reached my start line, as it were, just before I crossed the finish line. At the slowest point in turn two, I figured – what the heck – before I cool this thing down, let’s just have a nice powerslide out of the corner. At the flip-flop for turn 3, I over-corrected and got into a tank-slapper. Being alone and still on the blacktop, I jumped onto the brakes to bring it to an end. My trace looks like an etch-a-sketch and I look like a knob. But the 2014 Porsche Carrera Cup looks like being a vintage season.